This is the little-known "Kansas State banner," which, in some form, was first in use in 1925. Kansas Adjutant General Joe Nickell revised that banner into this one, which became the official "state banner" in 1953. The Kansas State Banner was adopted on June 30, 1953 and is still an official alternative to the State Flag, there being no distinction legally between them. It was designed by Adjutant General Joe Nickell; can be seen in the Governor's office; and is used by the Kansas National Guard. 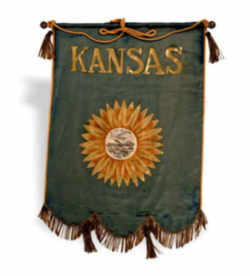 The Kansas Banner was used from 1925 to 1927. Made of painted silk, the banner measures 21 inches wide x 28 inches high. For two years, Kansas was the only state represented by a banner. Strong opposition arose. Some disliked the banner because it included the sunflower, viewed by many as a noxious weed. The main complaint was that the banner was awkward to hang and impossible to march with, and it had been rejected for display with other state's flags in Washington, DC. Around the turn of the century, many states pursued the matter of designating official state symbols. 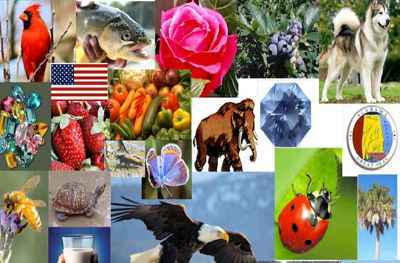 Kansas, as of its semi-centennial in 1911, had only two state symbols--the Great Seal and the sunflower. 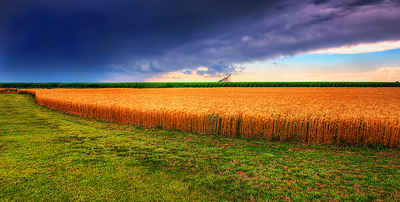 Kansas was one of only a few states without a flag. The state legislature began to feel considerable political pressure to designate a state flag. The fight to create a state flag would last for over a dozen years, with several designs being considered by the legislature during the early 1920s. In 1925 the legislature did select a state banner. As a banner it was designed to hang from a horizontal bar. 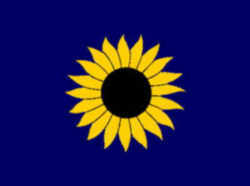 It contained the earlier familiar elements, the sunflower and state seal centered in a blue field. Above this was "Kansas" and at the bottom was a draped gold fringe. Rather than solve any problems, the selection of a banner intensified the conflict. The G.A.R. was the primary sponsor of the design and they were happy because the banner would not compete with the US flag. Some felt the sunflower was a weed worse than the "cocklebur" and thought it had no place. The D.A.R. was unhappy because they wanted a flag, not a banner. Groups such as the National Guard found it impossible to march with the banner. It was rejected for display with other state flags in Washington. It would be the influence of Adjutant General McLean who actually pushed the act "designating the form and color" of a state flag to passage on March 21, 1927. The basic elements were a blue field with the state seal in the center. Above this was the state crest. This was an insignia designated by the US War Department in 1923 and was made up of a sunflower beneath which was a bar or wreath meant to symbolize the Louisiana Purchase. The legislature in 1961 added the word "Kansas" to the bottom of the flag and required all schools to display it. In 1963 the size was reduced to make it smaller than the national flags. The law designating the State banner a is found in the Kansas General Statutes, Chapter 73, Article 7, Section 73-703 and 704. Chapter 73. - SOLDIERS, SAILORS AND PATRIOTIC EMBLEMS. Article 7. - FLAG AND PATRIOTIC EMBLEMS. KSA 73-703. State banner. A state banner be and the same is hereby adopted to be used on every and all occasions, when the state is officially and publicly represented, with the privilege of the use by all citizens on all fitting and appropriate occasions authorized by the state authorities. History: L. 1925, ch. 290, sec. 1; Feb. 27. KSA 73-704. Same; description; form and makeup. 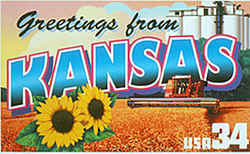 The official banner of the state of Kansas, provided for in K.S.A. 73-703, shall be of solid blue and shall be of the same tint as the color of the field of the United States flag, whose width shall be three-fourths of its length, with a sunflower in the center having a diameter of two-thirds of the space of the banner, enclosing and surrounding with its petals of gold, a brown center having a diameter of two-fifths the size of the sunflower. Service banners may be made of bunting or other material of such size as required on conforming to the proportionate specifications. History: L. 1925, ch. 290, sec. 2; L. 1953, ch. 360, sec. 1; June 30.